A fun gift for a music teacher, band mate, or rock star of life. When shredding, it's important to stay properly hydrated. 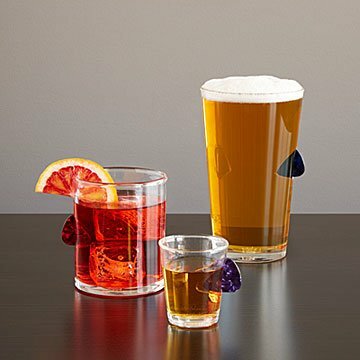 These glasses—shot, whiskey, or pint—each have a guitar pick cleverly wedged into its side, making it a fun gift for a music teacher, band mate, or rock star of life. Made of lightweight borosilicate in China. Still haven't found the details you're looking for? Check out our Product Q&A! within 8 days, arriving no later than the 9th business day after the order was placed. within 4 days, arriving 5 business days after the order was placed. within 2 days, arriving 3 business days after the order was placed. within 1 day, arriving 2 business days after the order was placed. will ship the same day and arrive 1 business day later. My dad loved this item! We got these glasses for both our Dad's and a matching one for my husband. They all share a love of playing music and love to play together. We added a matching red decal with their names. They really loved them. The glasses are beautiful and stylish, but also really cool. Find the best ideas for men, women and kids at UncommonGoods. We carry thousands of unique and unusual gifts, from fun jewelry and cool accessories to creative home decor and kitchen items.